If you’ve been around the internet in recent years, you’ve probably noticed all the different cinematic filters used on social media while posting pics. Over time those filters have advanced from simple still pictures to live streams in apps like Snapchat and Instagram. And now it’s even possible to use cinematic filters also known as LUTS, in programs like OBS. 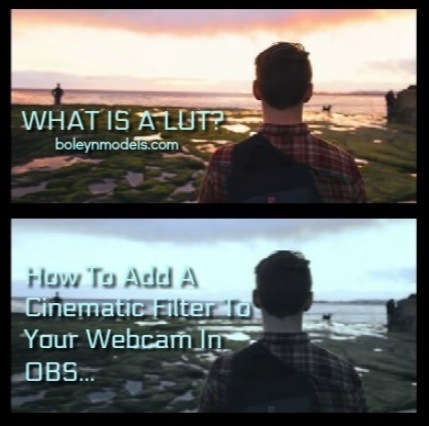 I will go in more detail down below on what exactly a LUT is, but I’m willing to bet you most likely know already. I’m especially sure you know what a LUT is, if you’ve ever spent waay too long deciding on the finishing touches for your selfies like I have. You may have just called it something different. If you want to learn how to get a more dramatic and creative look for your live cammodel stream keep reading. LUT (defined as Lookup Table) is a term used to describe a predetermined array of numbers that provide a shortcut for a specific computation. In the context of color grading, a LUT transforms color input values on your camera (WEBCAM) to your desired output values final footage. PRO TIP FOR CAMMODEL LIGHTING: Having Great Lighting Is A Key Factor When Using Any LUT/Filter. Be sure to do your research on how to acheive the best ligting setup for your live stream before attempting any sort of color correction. In addition to having a suitable light installment, consider your background color as well. One simple change to your background can effect the final result. I know it sounds complicated and way too technical, but if you aren’t tech savvy and super efficient in Photoshop and other editors, there are pre-made filters you can plug into your OBS software. I will link to two very simple how to videos down below and each one has a free download to several different LUTS that you can play with. These guys even tell you how to set it up step by step. This particular video is very helpful for both new cammodels with very little Photoshop experience as well as professional cammers. Even if you don’t have a custom made filter created in your preferred image editor you should still be able to follow along with this video. You should be able to Convert any LUT for OBS Studio similar to converting existing LUTs that you might be using for your video post production. It’s a very similar process. If you’re a cammodel looking for ways to make your live stream more animated and fun, there are filters and overlays available. However at this time I’m not 100% sure if the face mask options recently released in the Streamlabs version of OBS (SLOBS) is compatible with camsites. I just recently started playing around with them on my Twitch channel and it’s a great way to encourage donations plus engagement. They’re very similar to the face mask used on Snapchat and has the potential to take your webcam shows to the next level. Obviously this isn’t something you would want to use while in a private show, but I think it’s a great tool to have while hanging out in free chat especially if you’re on a token based camsite like Myfreecams. After I’ve done more research on how to implement Streamlabs OBS and the face mask filters into a camsite livestream I will update this article. If you have any ideas or tips you’d like to share please hit us up on Twitter @BoleynModels For now checkout this video on How TO Get More Donations With Face Mask.